Where can I get free historical intraday stock data? Discussion in 'Ask any question!' started by Ryannbob, Dec 2, 2018. I've been looking around, for many hours, but I didn't find anything. The farthest I got was Dukascopy where I could view historical intraday data with a demo account, but downloading is not possible (only forex data). I think now is the time to ask in a forum. I've also tried Google and Yahoo Finance, but they only have closing prices and no intraday data. So does anyone of you know where to get free historical intraday stock data (major international stocks, US and European, i.e. Apple, Volkswagen, Volvo, ..., 60min interval or less)? Also the format is not very important, but the simpler the better, for example a csv or txt file would be perfect. It would really help. Thank you! According to a 2014 posting at http://investexcel.net, you can get 15-days worth of intraday from Google using Excel, then wait 15 days, and download another 15 days to get a months worth. I'm sure you've already seen this from quantshare.com. But if I click on the quantshare.com link, I end up at investexcel.net. I installed Excel and tried this spreadsheet from investexcel, it doesn't work. 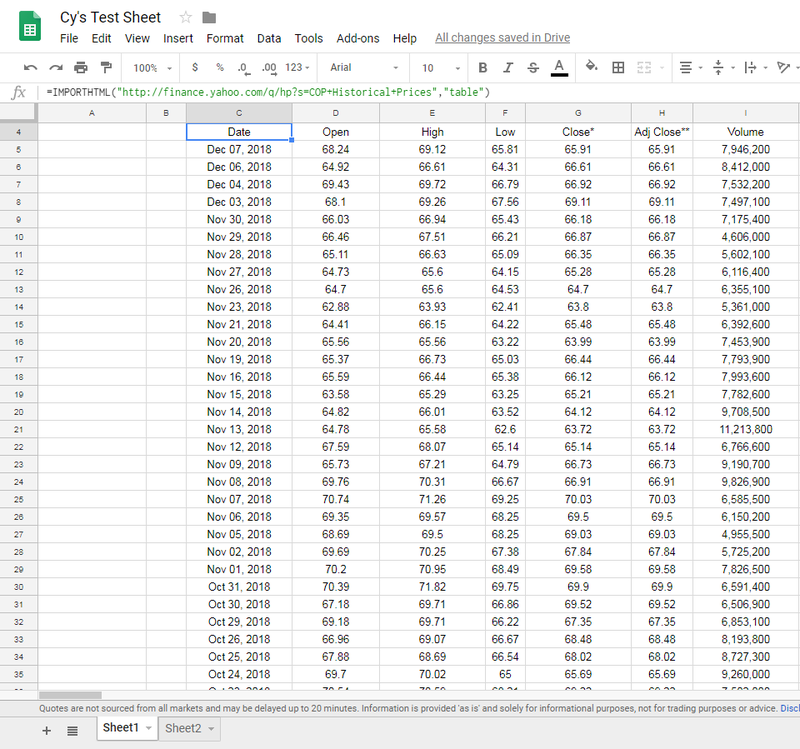 This spreadsheet is 4 years old. It might have worked years ago, but as far as I know Google and Yahoo changed something so that you can't get intraday data anymore. So I am again at the beginning. if I click on the quantshare.com link, I end up at investexcel.net. Ack! Let's try again here! If it would work, this link should give me 10 days of Apple intraday data, but it doesn't work. Would you mind to try this out? Maybe it is because I am not in the US. Would you mind to try this out? Then again, I just got back a couple weeks ago from being in Europe since May, and my laptop, phone, etc still thinks I'm in Europe no matter how many times I reset my location and try to sync it across my devices. So I may not be a good test, even though I am currently physically in USA. I read "some" posts on various forums and I can cofirm: it seems that all websites, which offered free intraday data until a few months ago, stopped this service (at least Google, Yahoo, a German site, some smaller websites,...). I tried about 15 websites, which seemed to work just fine a few moths/years ago. I guess here ends my search, I give up. I'm a little late with this reply here (sorry), just seeing this now for the first time. Firstly, before I even get started, admittedly I wasn't entirely sure what you meant by "intraday" data. I don't think Google Finance or Yahoo ever had "historical intraday data", or at least I don't ever remember seeing in the many years that I've been using them. Did you mean just the historical open, high, low, close, volume, etc. stuff like that? If not, then just disregard everything that I'm about to post below here. If that was what you meant, then have you tried putting this formula into a Google Sheet? 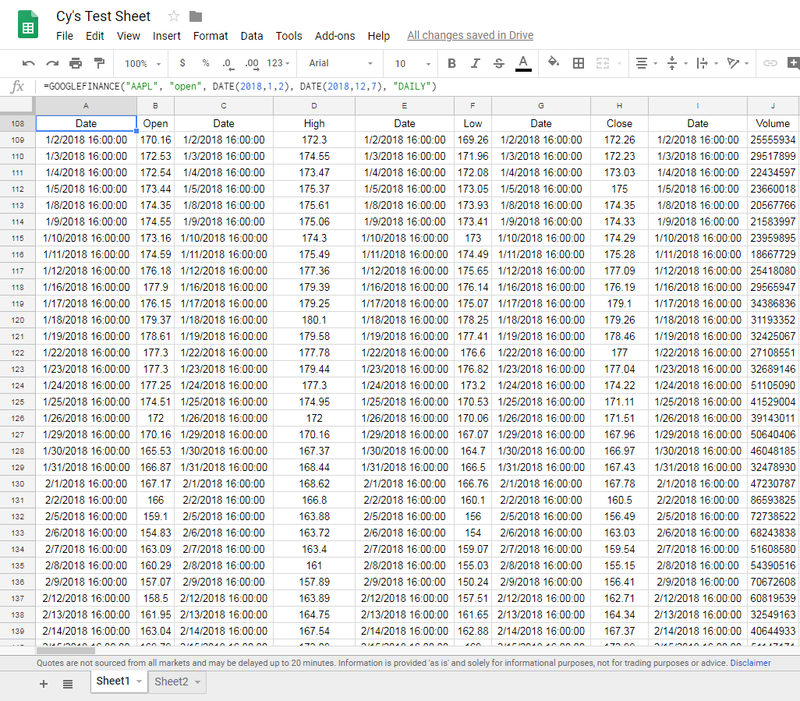 This will input a couple of months worth of data into Google Sheet via Yahoo Finance. (Where you see "AAPL", replace with your own ticker symbol of your choice, where it says "open" replace with open, high, low, close, volume, etc. and of course the starting and ending dates. Simply change the year (2018), month (1) and day (2) to your own starting dates, and the ending dates the same if you didn't want it to end at today's current date. Again, if this was not what you were looking for then just disregard all of this lol. Three Eyes and Onepoint272 like this. Quandl.com is a good source for intraday data (Algoseek is the stock data provider on the Quandl platform) and offers 1-min historical bars. If you need tick data then TickData.com is your best bet - as they provide institutional quality data for most tickers. FirstRateData.com has some free intraday datasets (1-min and 1-hour bars) going back to 2004, but only for S&P 500 stocks and a few indices.